Digital Marketing Creates Opportunities to Tell Your Story | Build. Connect. Engage. An essential function of digital marketing is the ability for companies to use popular social platforms to tell their story. 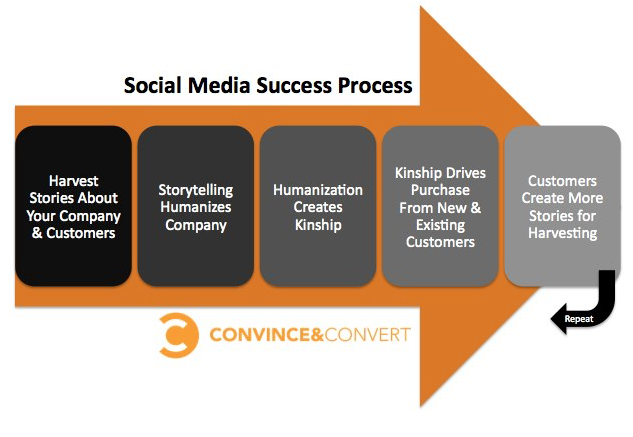 In my experience, I have observed that the companies that are successful at social marketing are those that find a unique voice and are proactive in generating a narrative that builds and supports their brand, drives engagement, supports their products, and increases sales. Interaction and dialogue are key in the process of informing, connecting with, and attracting customers. Gone are the days where organizations can simply push content to the consumer. Listening is just as important as speaking in social channels. As the above chart (which accompanied Baer’s blog post) suggests, this is an ongoing process. And it is a dialogue. Let your audience talk about you. Be involved in the discussion. By posting content regularly, you can tell your story AND encourage conversations in the customer community you are creating. You make some great points, Paul! The graphic you’ve included and your comments on dialogue between the brand and the consumer highlight one important part of online business – kinship. In the same way that people once knew their milkman or their favorite grocer, it’s important to establish an actual relationship to increase sales. While there isn’t much to be said for brand loyalty these days (especially to millennials), older generations still utilize those relationships and pass them on to their children. If the brand continues to engage in conversation with the younger generations on their chosen platforms, they stand a chance of maintaining that relationship!